Over the past two weeks I have been on a whirlwind tour to talk about Profiling PHP Applications (at PFCongres), but mostly about MongoDB at various (PHP) user groups in the South West of the US. 10gen (the makers of MongoDB and my employers) covered my time and flight, and provided me with some beer money. The tour concept started a few months ago when Ligaya Turmelle suggested that I should come and talk at the JaxPHP/JaxWeb, the PHP and web developers usergroup in Jacksonville, Florida. And while I was there, why not visit a few other user groups too? So after my short trip to the Netherlands to speak at PFCongres, I flew to Miami for the first stop of the MongoDB Tour. To fight off jetlag I landed a day early and together with Adam Culp from SoFloPHP we saw some of the sights there. Mostly, some wetlands and the beach. Sadly, no alligators were spotted but it was a nice quiet day before the storm. The user group meeting attracted over a dozen attendees and afterwards we had a drink with a few of us. I was slightly surprised that not (almost) all of the attendees joined us. However, it was good to catch up with Pablo from ServerGrove, even though I had met him in Utrecht the weekend before. Adam then drove me to Orlando for the hand-off with David Rogers at the Florida Mall. After doing some work, we also did the Orlando PHP user group meeting at the mall, in the Microsoft Store (conveniently located next to the Apple Store). Speaking in a store, with shopping public around was quiet a unique experience. But I am not sure if I would repeat that. Also, they don't know what a "loo" is there :-). David then drove me to Saint Augustine for the hand-off with Ligaya. After an afternoon of sight-seeing in the oldest city of the country, Lig and I headed to the usergroup venue in the Adecco offices. The venue was a bit hard to find, and sadly we lost some attendees because of that. However, the venue was nice and besides the PHP users of JaxPHP/JaxWeb, there were also a lot of developers using alternative languages. My presentation was therefore language-agnostic. This was probably the group with the most questions asked! Ligaya didn't want to make the 6-hour drive to Atlanta, so instead she put me on a plane. After negotiating MARTA, Kevin Roberts picked me up from the station and after a lunch and some work in the afternoon we headed to the user group venue at Strongbox. 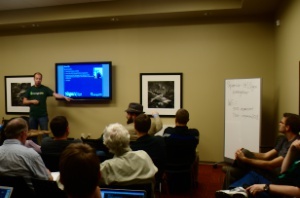 The Atlanta PHP group is traditionally quite a bit larger but the turn-out (compared to Meet-Up RSVPs) was a bit poor. Perhaps this was because the meeting was on a Friday evening though. This talk was recorded (both video and as screen capture). On Saturday Kevin and Chris Spruck joined me on my travels to Nashville. Along the way we did some sightseeing (Ruby Falls and Jack Daniel's distilery) and I had my first encounter with Waffle House. A small party was planned for us in the evening by Jacques to visit some of the Honky Tonks in town. I remember being given many different Bourbons to taste. Cal was hosting me and together with Kathy we ended up relaxing and having lunch at Loveless' Café. In the evening Cal had rounded up a bunch of locals (Jason Myers, Luke Stokes, Jacques Woodcock, Ben Ramsey) to have some drinks and record "Voices of the Elephpant - It's the Booze Talking". The general discussion resolved around community (and user groups). We iterated over quite a few things that Kevin, Chris and I discussed on the way from Atlanta, but also lots of other things (it was the booze talking afterall). The total recording time stands at two and a half hours, so let's see what Cal comes up with editting wise. Cal left for Code Works 2012 on Monday moring so I was being chaperoned by Luke to the Nashville PHP meeting. With free beer and pizza, the place was rather full, although about the same percentage of RSVPs actually showed up (~66%) as in Atlanta. And again, we were only four in the pub/bar afterwards to have a little more banter. This concluded the end of the tour, and I left on holiday to Seattle on Tuesday morning. All the usergroups used Meet-Up to track attendence, and without failure, only 50-66% of RSVPs showed up at the usergroups. Probably one of the reasons is that the meetings were on non-standard dates and in some cases in non-standard locations. I have always found that keeping the same day of the month and location does wonders for keeping attendence levels. In some cases, attendees did not show up because Meet-Up showed that the meeting was full (were of course in fact, there was still about 50% space left). This is a tricky thing. In some venues you have a hard cap on the amount of people, but if people just RSVP and then not show up, they clog up places that other people could have used. At least in one occasion that meant that the attendee simply did not show up. For PHP London we also have an RSVP system on Meet-Up with a cap of (about 130 people). Even though this indicates that the meeting might be full, the idea is that you can still show up anyway on a first-come, first-served base. I do not quite like this, as it often shows that the meet-up is full, and I feel (a bit) unwelcome. I think that user groups should call out to attendees who RSVP, but then not show up in the cases where this could be a problem. Another observation that I made is that dynamics of the user groups in the US are rather different then for example the UK. In the US, almost everybody drives to the meetings, and hence there is no possibility of having a social drink before and after the meeting. This compared to London, where this is a huge part. In my opinion, socializing is almost the most important thing of a usergroup meeting. All the slides are on the talks page and as soon as I have it, I will make available the recording from Atlanta PHP as well. Photos from the trip are on flickr. With this I conclude my wrap-up. I had an amazing time and made lots of new friends. I might be tempted to this again. It was great having you in South Florida, and thanks for the feedback. (we ended up with 19 attendees which is about our average) I have been playing a little with Open Streets since you left, thanks. I don't think you can ever really trust the meetup.com count. DallasPHP meets every 2nd tuesday of the month and at the same location. We have been meeting on this day ever since the group started, back in 2004 I believe. We still see about 50%-60% no show from meetup.com, but we have a good portion of people who don't use meetup.com and just show up every month. A lot of people mark attending just to get it on their calendar. Nice post on the places you visit and your thoughts on RSVP. In India, most of them RSVP like this, but less people come. Yes I think the people should atleast change the status to May Be or No if they cannot make it. So others who love to be there can enjoy the event. I think the after-meetup drinks thing depends on the city. The Perl, PHP, and Linux user groups I've been to around NYC seem really into the afterparty. Maybe it's not as big in the South.